This year the Parent Council has raised a fantastic £4086.00 for the school. This money benefits the children so a big thanks to everyone who has taken part in the events and given donations for tombolas and raffles etc. A lot of hard work goes into organising the events so a huge thanks to the members of the Parent Council and Mrs Fox and her staff who give up their time to help. Hope you all have a great summer with great weather and look forward to seeing you at our events next session. If you would like to help with the Parent Council please ask in school, email lasswadeprimaryparentscouncil@yahoo.co.uk or speak to a member of the Parent Council. Here’s our thermometer with the totals raised at each event and what the money has gone towards. 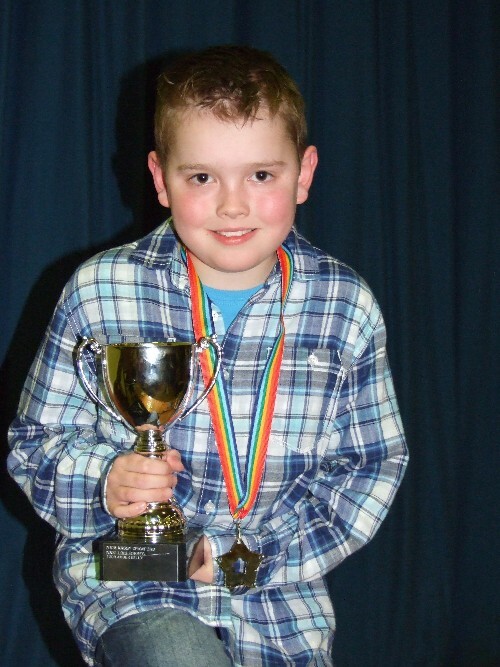 Lasswades Got Talent – Oh What A Night In Pictures! After a fantastic evening of entertainment and fun our LGT winner for 2011 was Christopher Dickson. Christopher did stand up comedy that would give even the best a run for their money. Well done Christopher and to everyone who took part – you were all stars. A big thank you to Matt Mason our Compere, the Judges, the Parent Council, all the teachers who helped make the night possible and to Gavin Blackie the Edinburghs Got Talent winner who helped to judge and got up and sung for us too – what a treat. Here is a slideshow of the evening. Here’s the newsletter for June with all the latest news from the school including details of staffing for the next session and the finalists for Lasswades Got Talent. We also have some news from P2 and the Poltonhall Gala Day. The First and Second Level Sports were held today and thankfully the weather held out. Click below to see some photos from the Second Level and well done to Borthwick who won the Second Level and to Melville who won the First Level. All the children thoroughly deserved their ice cream when they got back into school. A wonderful evening was spent listening to our talented children sing and play their musical instruments. We had lovely singing from our choir, great music from the string section who played violas, violins and cellos. Our recorder group who have only been playing for a short while did exceptionally well and the Sound Start Band comprising woodwind and brass instruments really entertained us with some fabulous tunes and had the whole hall clapping to We Will Rock You. Many thanks to the music teachers and specialists who help make this all happen and of course a huge well done to the children who were exceptional. £108.37 was raised for UNICEF so thank you for your donations. Here are some photos from the event. The Parent Council were conducting a Survey of parents who were at Sports Day to see what we should be spending the funds we raise on. If you missed the opportunity to take part then please email the Parent Council at lasswadeprimaryparentscouncil@yahoo.co.uk with your thoughts by 15 June. P7 are having a speed working afternoon where they get the opportunity to hear about the varying and interesting jobs that people do. We need some people to come along to help make this a great afternoon. Speed Working is like Speed Dating in that you will have different groups coming to hear what you do in your job for a set time limit, ask some question the move onto the next person. If you can spare some time on Wednesday 29 June from 1.30pm-3.00pm can you get in touch with the school. We began our new focus on water with an exciting visit from Generation Science. They came and taught us all about the Water Cycle and the different forms that water can take. It made everybody laugh and we got to join in with lots of fun experiments. We followed this visit with a trip to Vogrie Country Park which is the perfect place to learn about water by studying the river and the pond. We tried out the technique of ‘kick sampling’ to discover the variety of creatures living in the River Tyne. This gave us the evidence we needed to prove that it is a clean and unpolluted river. In the pond, we even found a golden tadpole! We all had a fantastic time exploring and learning about the ecosystems at Vogrie and would love to go back! We are now continuing this focus in class by trying out several science experiments involving water, from making a shape which can float on water to counting the number of water drops that can fit onto a penny. We are all very good at making predictions and recording our results. Through this project, we are realising how important water is to our lives and are trying our best to make sure we are not wasting this precious resource.